The newly engineered INFINITY2-1R scientific camera offers a significant performance increase for quantitative and low-light applications over its predecessor. Improved thermal management techniques combined with a much higher dynamic range and 14-bit output have resulted in a versatile entry-level research camera for documentation and image analysis in Life Science, Clinical and Material Science applications. The INFINITY2-1R easily manages seconds of exposure time with a dark current rating of less than 1 e-/s. Sharing and installation of one or more cameras on a single computer is quick and simple through a high-speed USB 2.0 interface. 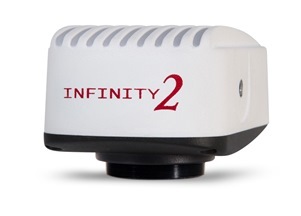 The INFINITY2-1R is available in color or monochrome, as well as OEM form factors including board-level and custom enclosures. INFINITY cameras are supported by an experienced team of technical support and imaging experts. We understand your imaging needs and are here to help you get the most out of your camera.